Russian President Vladimir Putin meets with FIFA President Gianni Infantino. Russia will do everything possible to prepare and organize the upcoming 2017 Confederations Cup and the 2018 World Cup at the highest possible level, Russian President Vladimir Putin told FIFA President Gianni Infantino. "We will do everything to bring facilities and terms of stay in Russia as well as well everything regarding the service provision to numerous fans, spectators and athletes to the highest possible level," Putin assured Infantino as they met on May 23 in Russia’s southern city of Krasnodar. The Russian president thanked Infantino and FIFA for the support and coordination of Russia’s preparations for both of the upcoming global football tournaments. "The development of football is one of the main reasons for granting the right of hosting the World Cup to countries, which still have the room for further progress and for raising the bars in terms of football and sports development," the Russian president said. Putin also expressed his pleasure that FIFA was positively assessing Russia’s preparations for the football tournaments adding that the country had been doing everything to provide decent conditions both for athletes and fans. He told Infantino that Russia was paying a significant attention in its preparations to the accommodation of foreign guests during both of FIFA Cups. FIFA President Infantino told Putin that the world’s governing football body had no doubts that Russia would fulfill all obligations undertaken in regard to the organization of the 2017 Confederations Cup and the 2018 World Cup. 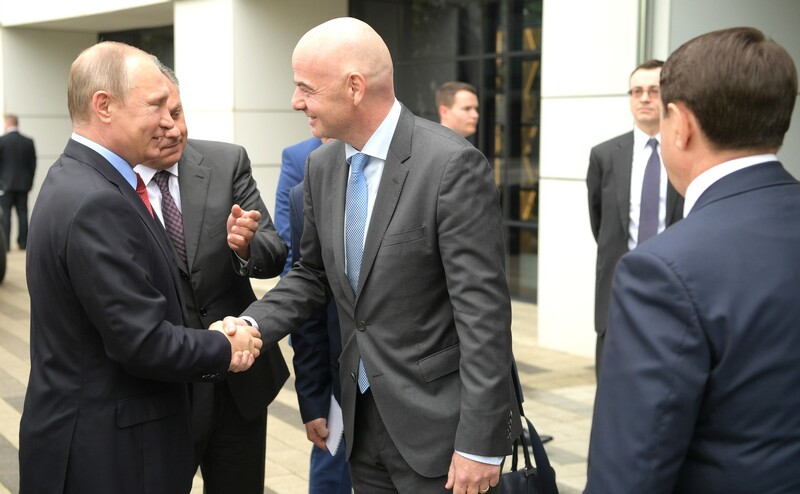 The FIFA chief thanked the Russian leader for the work on preparations saying that he, not only in the capacity of the FIFA president, but as a regular football fan was ready to invite the whole world to come to both tournaments in Russia and discover the country. Russia is currently in full-swing preparations for the global football tournaments. The country selected 11 host cities to be the venues for the matches of the 2018 World Cup and they are Moscow, St. Petersburg, Sochi, Kazan, Saransk, Kaliningrad, Volgograd, Rostov-on-Don, Nizhny Novgorod, Yekaterinburg and Samara. The FIFA Confederations Cup will be held between June 17 and July 2 in Moscow, St. Petersburg, Sochi and Kazan.